The Los Angeles metropolitan region has the worst traffic in America. According to the INRIX Traffic Scorecard which ranks the 25 U.S. cities with the worst traffic, drivers in the region spent 81 hours idling on freeways in 2015, the worst cumulative delay of any U.S. metropolitan area. A recent LA Times poll confirmed that traffic remains the top concern for Southern California residents, topping personal safety, housing costs, and retirement savings. According to researchers at the UCLA Institute of Transportation Studies, the only way traffic will get better is if policymakers intervene. 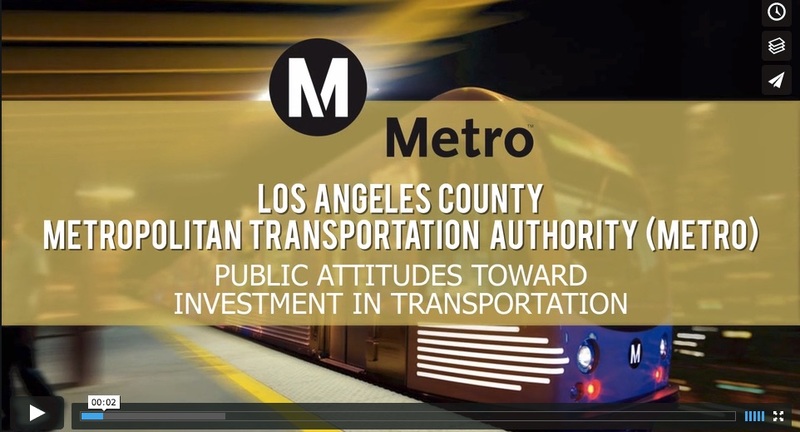 The Los Angeles County Metropolitan Transportation Authority (Metro) hired EVITARUS to conduct County-wide focus group research aimed at understanding resident perceptions of Metro, testing customer information about Metro services, and gauging reactions to completed projects and planned buildouts of the transportation system. A key component of the research also including assessments of voter support for a potential transportation sales tax to fund Metro’s Los Angeles County Traffic Improvement Plan. The groups included participants from the Santa Clarita and Antelope Valleys, South Bay and South Los Angeles regions, and the San Gabriel Valley and Gateway Cities. Following the research, the Board of Directors of Metro moved to place a transportation finance measure on the November 2016 ballot.